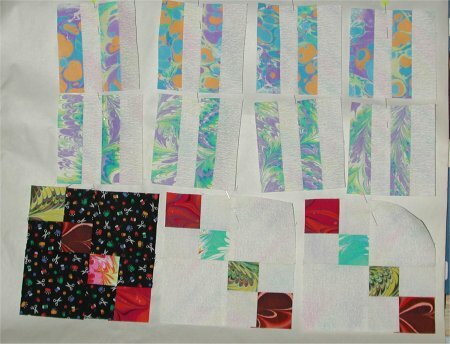 In August of 2001, I entered Poppies Fabrics Challenge Quilt showcasing the RJR Stained Glass line. 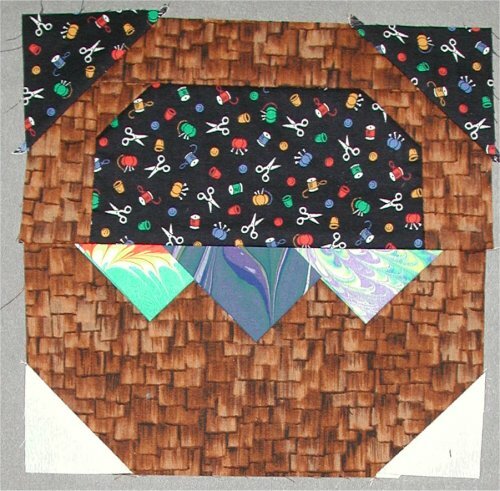 The layout I eventually chose to do came from "Shadow Quilts" by Patricia Magaret & Donna Slusser. 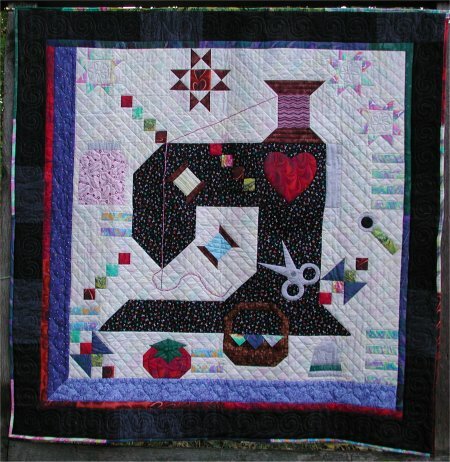 One quilt pictured in the book was of a sewing machine surrounded by smaller blocks of sewing accessories and sampler blocks. Unfortunately, the pattern for this quilt wasn't given. 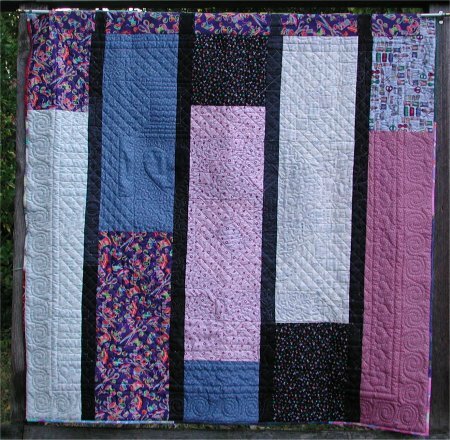 However, from the book, I found their website, where I delighted to find that the sewing machine machine quilt was being offered as an online class! The class was 8 lessons long, spaced 2 weeks apart. Every Tuesday/Wednesday a new lesson would be uploaded to the class site. The students could then print it out and go to work. 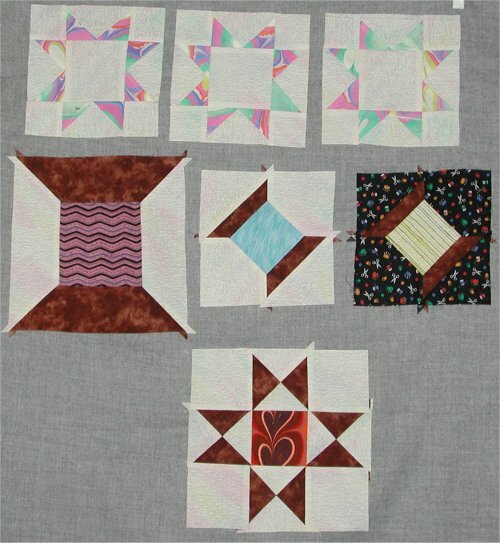 The very first lesson contained a LOT of very basic, beginning quilting making information (all very useful, I'm sure. I did skim it over because one never knows if a new pearl of wisdom will emerge) and the very first quilt block was .... rail fence. I then had to wait 2 weeks for the next lesson. And so began the process .. I'd eagerly wait for the next lesson to be uploaded; I'd promply print it off and make up the block; send the digital picture back to Patricia & Donna where it would be put into the class gallery .. and then wait. I had previously taken a fabric marbeling class and had about 10 pieces of lovely marbled fabric that I was saving for "something". Well, this project turned out to be ideal for using my marbled fabric. I also have collected (and hoarded!) over the years, many pieces of sewing-themed fabric. I decided this was the perfect quilt to use that yardage in. First I stabilized all the individual motifs with stitch-in-the-ditch. Then I cross-hatched the background material, using the blue painter's masking tape (its sort of like sticky-note masking tape .. it only sticks temporarily and leaves absolutely NO residue .. it's great stuff!) as a guide for the spacing. The sewing machine was done in a meandering stitch. I'm not terrifically happy with this meandering, as my machine (for whatever reason .. maybe it was tired by this time) started skipping stitches at various intervals. It was exceedingly frustrating to deal with. The binding was made from strips of my marbled fabric, sewn together into a very long strip and applied as a double-fold binding with mitered corners. 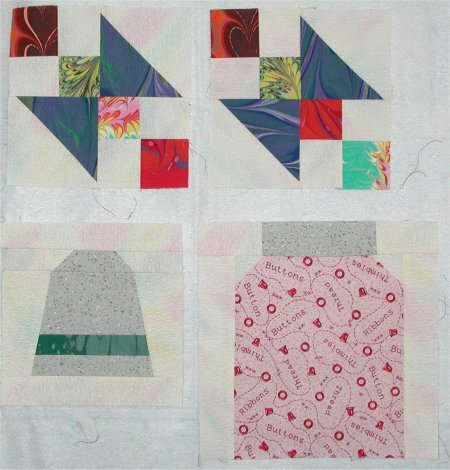 Remember, this project was intended for beginning quilters .. the blocks are NOT difficult. 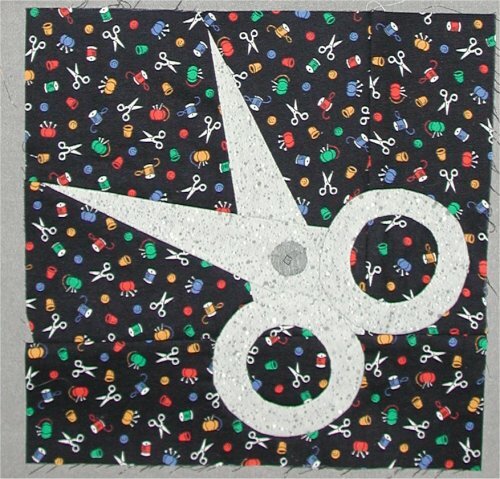 They were designed to increase the beginning quilter's self-confidence and sewing ability. The other lessons were for assembly and quilting. For the back of the quilt, I didn't have one piece large enough to make a whole-cloth backing, I decided that this project was "worthy" of using my sewing themed fabric for the backing. So, I have large strips of the sewing motif fabric (two of which had already been used in the quilt front), alternating with narrow strips of the black fabric. I also sewed on a hanging sleeve at the top. 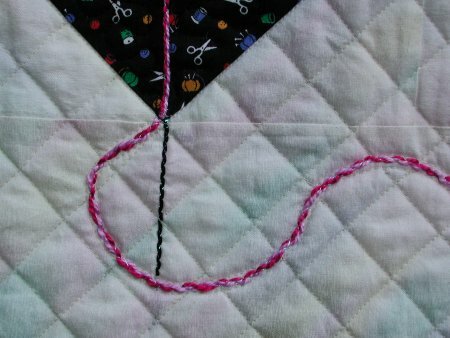 This detail picture is of the "thread" and the "needle". I used DMC pearl cotton, size 3, for them both. The thread coming off the spool at the top of the machine is actually 2 different colors twisted together: a hot pink and a pale lavender. The needle is plain black. I zig-zagged over the pearl cotton using Superior Threads Glitter, #114, which has a nifty translucent rainbow effect (sort of a like an oil-slick on a highway). 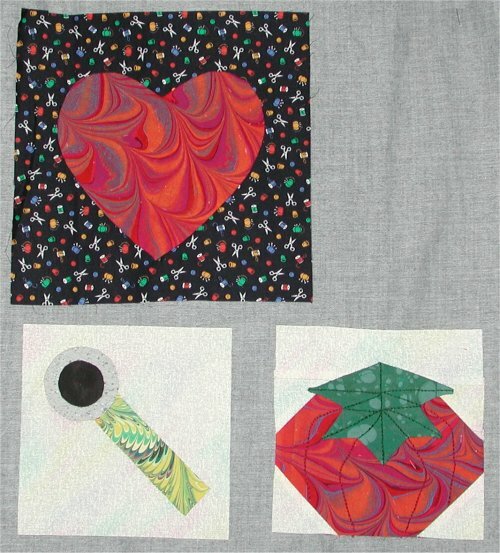 This detail picture is of the two borders: in the Attic Window border, I used a stencil to quilt a series of hearts and circles, because I love quiling. The hearts-and-circles and the loopy sawtooth star designs were quilted in Superior Thread Metallic N36, a medium blue metallic. 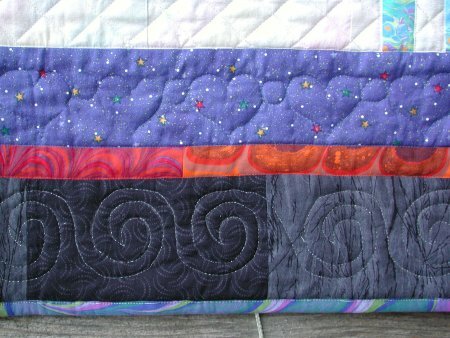 The spirals were quilted in Sulky Metallic #142-7023, which is a silver-black metallic thread. Everything else was quilted in regular ol' thread.